Martin Truex Jr. is among the Chase drivers looking at Sunday's race at Martinsville as a fresh start. 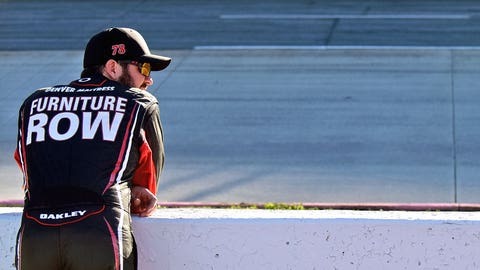 Sunday’s Goody’s Headache Relief Shot 500 at Martinsville Speedway marks a new beginning for the eight remaining drivers in the Chase for the NASCAR Sprint Cup. With their point totals reset at the conclusion of the previous round, the eight drivers still in the hunt for the Sprint Cup title each carry 4,000 points into the first of three races — formally known as the Eliminator Round — from which the championship field will be whittled to four finalists. Don’t be deceived by the current gridlock at the top of the standings, however. There’s a clear frontrunner among the bunch — and he’s easy to pick out. A winner of the past three races, Joey Logano enters Sunday’s 500-lap event at the .526-mile Martinsville short track as the hands-down favorite to go to Victory Lane. Sure, he’s never won in 13 starts at Martinsville, but that statistic seems irrelevant when considering Logano’s dominance over the past three weekends — and really for much of the season. 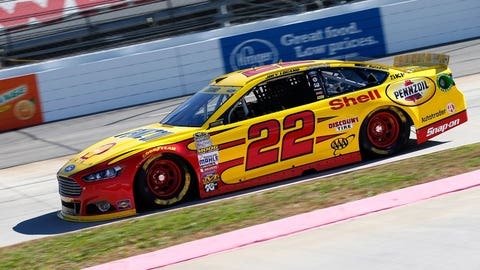 Throw in the fact that Logano will lead the field to the green flag Sunday after capturing his first Martinsville pole on Friday, and all signs seem to point toward another superb outing for the driver of the No. 22 Team Penske Ford. Logano, for his part, admits it’s hard not to be extra upbeat when his team led by crew chief Todd Gordon can seemingly do no wrong. "Everyone is more confident in the decisions they make, which is a good thing," Logano told FOXSports.com on Friday at Martinsville. "Todd is confident in the changes he makes. The mechanics do a great job and my team does a great job on just being confident in the changes they make on the race car and making sure it’s the right way and they know how to do it. "It’s just a different attitude when you start to run well on the racetrack like we have been here lately. That’s a good thing that we’ve got going for us." Jeff Gordon, an eight-time Martinsville winner set to make what will likely be his final start at the Virginia short track, concedes that Logano is the clear championship favorite heading into the penultimate Chase round. Logano says that while receiving such adulation from a four-time Sprint Cup Series champion is "pretty neat," he wants to guard against overconfidence. And rightfully so. After all, no one expected six-time champion Jimmie Johnson to fail to advance out of the Challenger Round of this year’s Chase. Likewise, no one thought Matt Kenseth — a five-time winner this year — wouldn’t make it through the Contender Round. 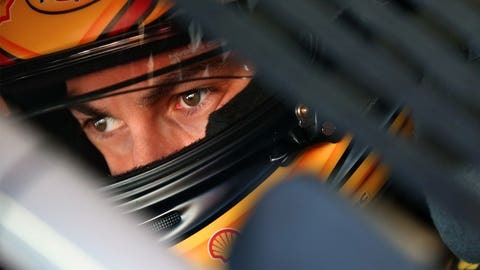 Logano believes the unpredictable nature of the elimination format makes him as vulnerable as anyone. "Do I feel like it’s ours to lose? No, I don’t think that way," Logano said. "I know there are a lot of really good race teams. … I don’t look at it as just one car we have to beat or who is the best car. We have to beat everyone to do this and, to me, it doesn’t matter who moves on as long as we move on, because when we get to Homestead you’re still gonna have to win the race. That’s plain and simple, so it is what it is. Right now, yes, everything is clicking great. We’re doing everything right. It can all change in the blink of an eye." And that’s especially true at Martinsville, a short track known for close racing that often breeds short tempers. Martinsville, with its tight, mostly flat corners, is also a notoriously tough place to pass and recover from any kind of issues. "Restarts are really tough," said Chase driver Martin Truex Jr., who will start on the outside of the front row alongside Logano. "You really hope and pray and try to plan on those pit stops leaving pit road, to try to get the bottom lane on those restarts, because it’s so critical. So that’s certainly a part of it. Track position. And then, you know a pit-road penalty or something like that here late in the race can really hurt you. "This is one of those places where it’s really difficult to make it up. You’ve got to be mistake-free here, and there’s always that potential anywhere we go; but short tracks, it’s definitely hard to make those spots up." On Sunday, it might be even harder for someone to catch Logano.